How Does Dewarping Technology Work in Surveillance Applications? The use of 360° surveillance technology continues to rise rapidly. Panoramic cameras are a fast-growing IP video segment thanks to the dewarped view captured of an entire area. A 360° fisheye and panoramic security camera provides 360° surround view. By creating an all-encompassing, panoramic, or wide-angle 360° security view, more data are captured, making these cameras the perfect solution for a variety of surveillance applications. At the center of 360° surveillance devices is dewarping functionality. The fisheye lens on panoramic cameras can see wider than any other type of lens. The wide angle hemispherical image from the lens in its original form looks curved with a non-rectilinear appearance. Dewarping refers to the process of correcting an image, to reverse the effects of geometric distortions caused by the camera lens found in fisheye or 360º devices. Dewarping takes images from a fisheye camera or 360° device and alters the original shape to allow users to view portions of the full video image without distortion. It makes “virtual camera views” appear to look like a standard camera image. Dewarping allows the user to capture a wide area with a single device and have a normal view of an otherwise distorted image. Whether dewarping is on the camera, or is a client dewarping surveillance solution, or if using a mobile device to view dewarped images on the go, the application can identify any point of interest bringing total situational awareness to that space. Models with day and night vision allow you to record for forensic details or zoom in on everything in the field of view all the time for live details without any blind spots. The viewer is able to keep track of suspicious activity from high-resolution images. With a dewarped device, operators can quickly digitally zoom into portions of the image, functioning as a virtual PTZ, get views from four different angles simultaneously, and also utilize a 360° panoramic overview without moving the camera. By providing complete field-of-view coverage, it significantly reduces the number of cameras required to cover a particular area. 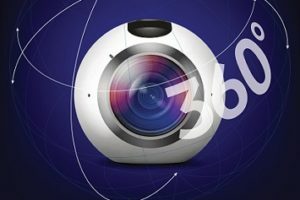 A wide choice of cameras, recording platforms, and monitoring control options is contributing to a growing demand for 360° cameras, which are proving ideal for covering large areas and in retail applications. The dewarping technology found in 360° video security devices is especially helpful in industries that require effective coverage of spacious rooms, intersecting hallways, or wide outdoor areas. In some installations, one 360° camera can view an area that previously required four to eight cameras. Reducing equipment requirements, infrastructure and security personnel will save money now and in the future.